At degree level, this module provides comprehensive and contemporary knowledge and skills about moving and handling, and risk assessment. You will learn to facilitate the implementation of patient care informed by the principles of ergonomics, biomechanics and safe manual handling; and to systematically evaluate and implement appropriate risk management strategies to reduce the risk of injury associated with manual handling. With this knowledge and skill, you will be empowered to promote high quality care and standards within the workplace setting by disseminating evidence based practice. At diploma level, this module equips you with moving and handling knowledge, utilising the concepts of risk assessment and health promotion to ensure a safe environment for clients, carers and healthcare workers. 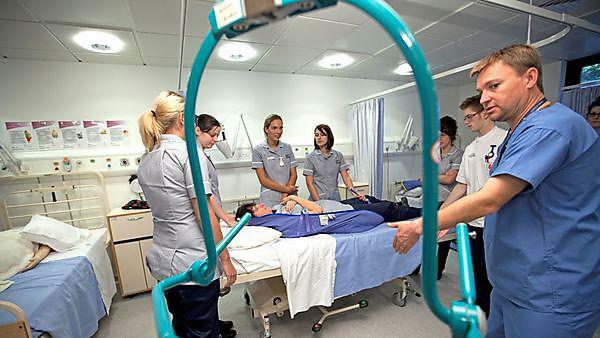 The module aims to facilitate the acquisition of evidence based knowledge and expertise to train others in the manual handling of loads in the workplace; and to encourage the development of a critical, reflective and problem-solving approach towards the safe delivery of training in health and social care organisations. Please note that at diploma level this module is titled ‘NURB294 - Introductory course for trainers in moving and handling’. This module can be studied as a standalone module at both levels or as an optional module towards some of our BSc (Hons) Professional Development pathways at degree level - please contact the Professional Development Unit for further information. This module is delivered by Northern Devon Healthcare NHS Trust in partnership with University of Plymouth. For further information on entry requirements, fees and funding and how to apply please contact the relevant Education Co-ordinator for the trust where you wish to undertake the module. Professional Development Unit, Level 4 Rolle Building, University of Plymouth, Drake Circus, Plymouth, PL4 8AA, United Kingdom.